Do you want your mom or dad to have company at home while you’re away at work? Daytime hours don’t have to be spent alone or in isolation. 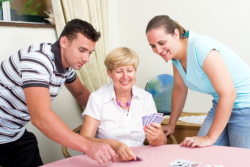 Our companions from Colorado Family Quality Home Care in Aurora, Colorado will be happy to give them human interaction they need which also doubles as safety supervision. If you have questions about companionship, personal care or any of our home health care services, please feel free to call Colorado Family Quality Home Care at 303-632-7225.